Asphalt Institute Vacuum Viscometers - Gilson Co.
Asphalt Institute Vacuum Viscometers are used to measure highly viscous materials such as bitumen, also known as asphalt cement. A minimum sample size of 3ml and a bath depth of 7in (180mm) are required for testing. The elapsed time for a fixed volume of liquid to be drawn through the capillary tube is multiplied by a constant to determine absolute viscosity. 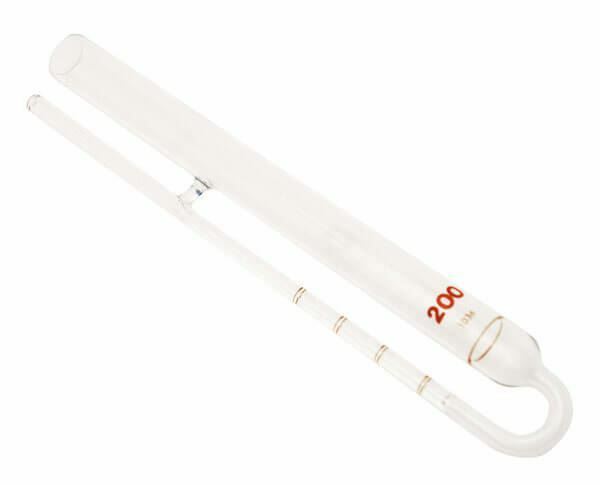 Capillary is graduated and a Certificate of Calibration is included with each Viscometer. The PTA-100 Viscometer Neoprene Holder, available separately, fits the Viscometer’s 2in (51mm) hole and is required for operation. Inquire about availability of fixed metal holders for the Viscometer. Constant Temperature Viscosity Bath is also available separately. The Asphalt Institute Vacuum Viscometers come in five models of varying sizes and range of viscosity. Each model measures viscosity at 140°F (60°C). PT-111 Asphalt Institute Vacuum Viscometer, Size 25 with a viscosity range of 42—800 poise. PT-112 Asphalt Institute Vacuum Viscometer, Size 50 has a viscosity range of 180—3,200 poise. PT-113 Asphalt Institute Vacuum Viscometer, Size 100 offers a viscosity range of 600—12,800 poise. PT-114 Asphalt Institute Vacuum Viscometer, Size 200 provides a viscosity range of 2,400—52,000 poise. PT-115 Asphalt Institute Vacuum Viscometer, Size 400 has a viscosity range of 9,600—200,000 poise.